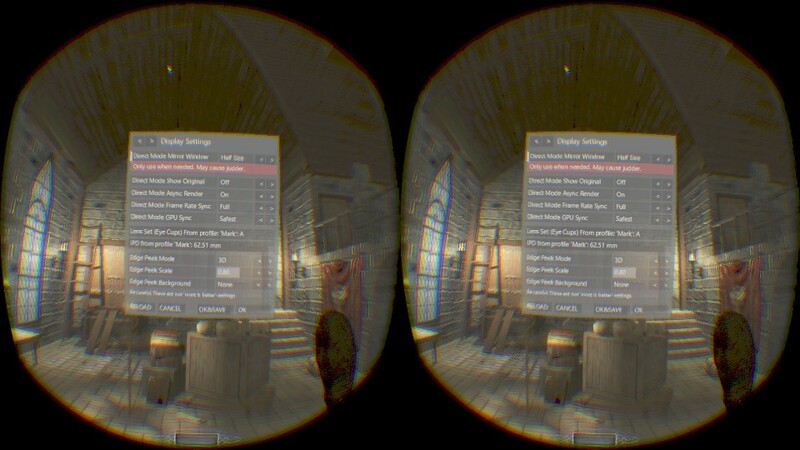 I'm updating my post to include a guide to get TDM running with VR headsets using Vorpx. I'll leave the original post below, as it's not my intent to revise history. I think it makes sense to try to keep these discussions consolidated, but please let me know if you'd prefer I start a new topic. With the release of the 2.05, the unlocked framerate makes TDM work better with Vorpx. While the original post aimed to share what I discovered and start a discussion, I think people may find it more helpful now to have the necessary steps on display in the OP when coming across this topic. 1. Buy& install vorpx: http://www.vorpx.com/. Vorpx is a stereo injector that allows you to play non-VR games in VR. There are other free options out there that are being worked on that may be worth keeping an eye on for the future (vireio, a re-shade branch), but as far as I know, Vorpx is the only way to get TDM working at present. 2. Open your TDM installation folder & find your Darkmod.cfg file. Back it up. I have a folder with a monitor cfg and one with a VR cfg. You can switch from one to the other just by dropping in the respective file and overwriting. 4. With the Darkmod.cfg still open, find seta r_fovRatio and change it to 0.9 if you're using an 8:9 resolution as indicated in step 2. It should look like this: seta r_fovRatio "0.9." If you're using a different aspect ratio, it may take some trial and error to find the right value to enter here. You'll know it's off if everything appears either "too zoomed in" or has a fisheye warping effect. 5. Save & close the Darkmod.cfg file. 6. Create an autoexec.cfg file in the same folder as your Darkmod.cfg and open it up. You can just copy the Darkmod.cfg file, rename it to autoexec.cfg and delete all of the contents. This will allow the game to go above 60fps and/or allow vorpx to set it's "Async render" to 45fps or 90fps (depending on your hardware) allowing for a smoother experience than would otherwise be possible, as far as I understand it. 8. Save & close the autoexec.cfg file. 10. Save & close the autocommands.cfg file. 11. Download either grodenglaive's (Vive) or bucklebean's (Rift) vorpx cloud profile using the vorpx config app & follow the instructions to import it. Either profile may be a good starting point for either headset. It might be wise to try each & go from there. 12. Depending on your headset, you'll need to launch SteamVR or Oculus Home. 14. Launch TDM & disable post processing. Otherwise, you'll get flickering light sources. I also suggest disabling in-game AA to maintain decent FPS. 15. Vorpx translates mouse movement into head tracking. You should consider setting smooth mouse to off. You're going to want to tweak your in-game mouse sensitivity along with the vorpx head tracking sensitivity which can be found in the vorpx in-game menu. 16. Play TDM in VR - You'll probably want/need to press edge-peek (MMB default) to navigate the menu. - Sometimes the main menu can flicker or completely disappear! Don't fear. Just press the edge peek button (MMB default) and your menu should come back. - The skybox doesn't appear correctly in 3D. There's a console command to remove the skybox completely, but the sky will flash/flicker. I don't have a fix. - Vorpx has a few 3D modes - G3D, Z-normal & Z-adaptive. The Z-modes DO NOT WORK. If you accidentally set one of these, you'll be greeted with blurry horizontal lines. You should be able to press your keyboard left & right arrow keys to set it back to G3D. If you can't, you're best bet is to shut down the game. You may not have saved that config, so a restart of the game might fix it. If not, you can try jumping back in and navigating the vorpx menu blind, but it's probably easier to just restore the cloud profile in the vorpx config app. - The settings from the vorpx cloud profiles might not be to your taste. Once in-game, press the "DEL" key to open up the vorpx menu. Here you'll find several tabs where you can make numerous tweaks to personalize your experience. You may even want to create your own custom profile to share. Some of the tweaks need "advanced settings" to be enabled on the main page of the vorpx launcher. - If you find that game objects, NPCs, doorways, etc... appear to be too large or too small, you'll want to adjust the stereo separation to taste. - If you find the game too bright or dark, you can adjust the gamma. The in-game gamma & brightness does not work. - You may want to adjust the sharpness setting to taste. My default profile has this all the way up. - If you set "fluidsync" on, the game will lock to no greater than 45fps. You may find this more comfortable than a variable framerate. I prefer to have this off most of the time because the Vive, Rift, & vorpx all have built-in software solutions to help with this. I want to be clear, VR, especially with vorpx requires a lot of power to run. However, with these software solutions, framerates that drop even into the 20's or 30's are surprisingly playable. What you are willing to put up with is going to be a matter of personal preference. You can check your framerate by pressing att+f. It might be wise to take a look at the TDM wiki for information on how to improve performance. You want to maintain as high a framerate as possible for the most comfortable experience. If your framerates are just so bad & you can't handle it at all, you may want to try turning off 3D entirely in the vorpx menu. You will lose depth (obviously) but your framerate will skyrocket. It should be close to what you normally see outside of VR. While the 3D is particularly excellent for this title, even by vorpx standards, it's not everything. The performance hit is huge and it's a trade-off you may wish to consider. 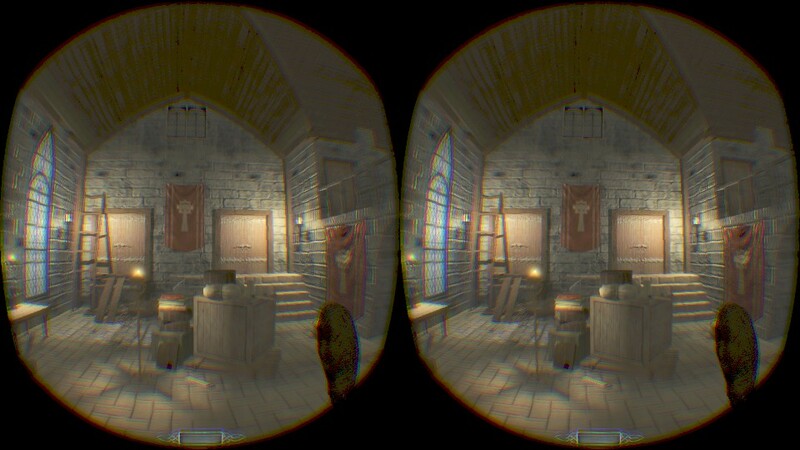 - You may want to play with the letterbox & pixel 1:1 settings in the vorpx menu to assist with FOV adjustment. Use these in conjunction with the aspect ratio settings and the fov ratio settings. - You can set how far the screen pops out for edge peek. You may find it preferable to move it closer to make readables easier. This requires the advanced settings to be enabled in the vorpx config app. - You can play with motion controls as controller input. The controllers will be represented in the game world, but cannot interact with anything without a button press. It's interesting and may increase immersion, but I still prefer M+KB. YMMV. If you want to do this, you'll have to open the in-game vorpx menu by pressing "DEL" or the controller equivalent & remap the buttons to your liking. I'd really like to thank everyone working on this project. You've truly created something very special here and I feel quite fortunate to have stumbled onto this a couple of years ago. When I received the DK2 last summer, one of the first things I did was attempt to get The Dark Mod working with 3rd -party injection drivers vireio perception (http://www.mtbs3d.com/new-vireio-site) and vorpx (http://www.vorpx.com/). Sadly, neither would hook because they are based on directx and TDM uses opengl. I talked to some folks working on the Doom 3 oculus implementation project and even downloaded TDM source code with the intent to try my hand at support, but quickly learned I was in WAY over my head. Fast-forward to 10/23/15 and the latest version of vorpx has preliminary support for opengl titles. The first thing I tried was TDM and it hooked! Huge disclaimer: the game does not have official support. There is NO 3D effect, nor is there positional tracking. Head tracking is intact, so your head movements are like mouse-look, but not the full 6-degrees of freedom (like leaning forward, backward, up, down...). Framerate is also a minor issue (see below). I want to be very clear that this is far from perfect. VR purists would probably not touch this. I am, however, quite pleased as punch. I learned a long time ago not to allow the perfect to be the enemy of the good. FWIW, in a very short time I have determined that this will be my preferred method of playing. I booted up Tears of Saint Lucia and I can't describe the feeling of looking up at the buildings. The sense of scale is spot on. And oh my god, this game is DARK on the OLED screen. The flickering torches and candles in the distance... the lighting in this game is glorious. The atmosphere is visceral. The slow, careful, stealth pacing is perfect for VR. Frantic movements are generally not good. This is the opposite. - Framerate - generally, a rock-solid 75fps is required to have a good experience on the DK2. TDM is locked to 60 (or 62/63?). I could not figure out how to unlock it again. I had done that before when I got my 144hz monitor, which I quickly learned was a mistake. The speed of the game was all out of whack. Still, I'd like to see how it operates at 75. Nevertheless, the very good news is the latest version of vorpx also incorporates asynchronous timewarp, which eliminates the stutter/judder that occurs when the framerate drops below 75. The game is smooth sailing and would not be playable without this feature. And that's it! Please let me know if you have any questions or suggestions. I'd be curious to see how others are getting on. The first 3 on that list I have done complete playthroughs, including DLC. The rest to varying degrees. The stealth genre is so perfect for VR because combat can be avoided (if desired), you can usually move at your own place, exploration is rewarded, and the atmosphere in these games is among the best. I often find myself just sitting quietly listening to the patter of the rain or the crackle of a fireplace, soaking it all in. p.s. - It's also helpful to be pretty familiar with the game mechanics because you can't see the m+kb. Edited by BuckleBean, 03 April 2017 - 08:40 AM. Fov is set with the g_fov command. Couldn't get that to work. Also found a thread where it was discussed that this was changed. Edited by BuckleBean, 27 October 2015 - 09:37 AM. I don't know this stuff, but I wonder if some of those issues could have a solution in the TDM code, a branch with a VR mode for now maybe. But if opengl is in & expected to get updated, maybe it's better to wait and that'd be better in the end. Or maybe a mix of both fix some & wait for some. I shouldn't prejudge the source of the problems. This is great news in any event! Without a doubt, native support would trump injection drivers in every way. I've seen it discussed here a few times. Someone has gotten Doom 3 working and suggested that his changes on github could be merged with TDM code: https://forums.oculu...pic.php?t=12695. I took a look at that and learned it was beyond my abilities. But yes, opengl is now in with vorpx. When/if it gets updated, is totally up in the air. Based on comments from the vorpx dev, it sounds like it's a game-by-game basis, so it remains a mystery. There's also vireio, which is free and open source. They have not yet confirmed opengl support, but have teased a big announcement soon. We shall see. But essentially with these things, as long as a handful of these variables can be tweaked, we should be able to get things set up rather comfortably. The FOV issue is pretty much sorted out. Regarding framerate, my understanding is that it would be pretty damn near impossible to get the game working at 60+ fps without breaking things. The async timewarp present in the vorpx code does a great job compensating for this, though. I'm actually very pleased with the results. Before this update, anything sub-75fps would look like a vomit-inducing, stuttering, flip book. Oculus has plans to incorporate it into their sdk at some point, IIRC. I don't think there's any way to get proper 3D unfortunately unless the vorpx dev creates a profile. Still, TDM on the rift is a remarkable experience even at this bare-bones level. @BB, got a in-game video for use to have a look at..? I've given it a try and it's simply not working. Part of the problem is Oculus removed the "Extended monitor" mode, which used to treat the rift as a monitor. It was a hassle really, but it had the benefit of making videos much easier. To compensate, vorpx has a mode that mirrors the rift onto the monitor. Sadly, I can't get it to work. It just freezes after a split second. I was able to take some screenshots, though. The images look very washed out compared to how they appear on the rift. Not sure what's going on there. Edited by BuckleBean, 27 October 2015 - 11:34 AM. The grandaddy of contests dropped by right in the middle of our Halloween contest if you're curious for something to play. I agree I'd love to try an FM on the Rift too. Progress update: some good news & some bad news. The good news is I've gotten the game to display in 3D with positional tracking by using a little trick to force the game to utilize a profile designed for a different game. In this case, Star Trek Voyager - Elite Force. This has the obvious drawback of not being tailored to the game's specific issues, so there may be some 3D-related graphical anomalies. I was inspired by this reddit post: https://www.reddit.c...so_good_i_cant/. The way to do this is to rename the TDM executable to stvoy.exe. This method is hit or miss, more often a miss, but I was happy to see it work in this case. The bad news is that with Geometry 3D enabled, the game is forcing the framerate to hover around 31, or about half of the normal cap even with all gfx settings as low as possible (minus resolution). This suggested to me to be vsync related, but no matter what vsync setting I chose (both in game & in the nvidia control panel), I could not get this cap lifted by that method. I think it could be tied to the game engine somehow. I dug around online and re-discovered this thread for unlocking framerate: http://forums.thedar...ering-solution/. This worked, but it was wildly variable & caused the speed of the game to be all out of whack & inconsistent. It was a more comfortable visual experience, but really screwed up play-ability. Even with the game locked to 31fps, the headtracking is still at 75fps due to async timewarp, so it's not out of the question for some. I can't stress enough what a world of difference this is compared to how things used to be without async timewarp. Previously, it would be considered impossible or unplayable. With this, I bet there are a small number of folks who would find it acceptable. Sadly, it's not quite enough for my taste. This is a situation of trade-offs and at this point, I will likely forgo natural-looking 3D & positional tracking for a better, more consistent framerate. I may try lowering the resolution to see if I can get any further performance gains so that the fps is always 60+, unlock the framerate with the console command detailed in the post above, and then use rivatuner to cap it at 60. I'm not sure if this'll work, but it may be worth a try. As an aside, it was very much worth experiencing the game in full 3D, even if just for a short time. Actually leaning to see around corners was a trip! Using the bow, you need to close one eye to properly aim. It's such a beautiful game, the lighting in particular frequently takes my breath away. Whether or not TDM ever gets "full support," I'm confident that it's just a matter of time before someone figures out that this formula is a perfect fit for VR & comes up with something great. On a whim, I tried using the nvidia 3d vision wrapper found here: https://forums.gefor...vision-wrapper/. I was able to get the title screen to display on my monitor in SBS mode, but it crashed to desktop when trying to launch a mission. It may be another avenue worth exploring with the right settings tweaked. Some additional info: setting the resolution to 1600x1800 does not seem to impact performance with 3D disabled, but provides a nice boost in picture quality, especially because I have AA disabled. AA kills performance for me even on my monitor. Bumping the resolution any higher and I started to see my fps drop. I also found that zooming the image out to 0.92 in the vorpx settings further reduced the fov warping. This setting will likely be user dependent to slight varying degrees, because stuff like how tight you wear the HMD or how you have the lenses dialed (in or out) will have a minor perceivable impact on fov. 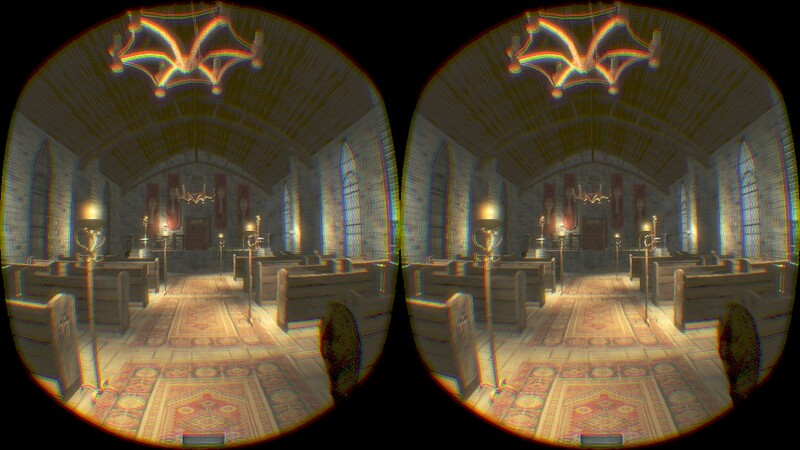 Also, for users who don't have an actual VR device, it would be nice if basic anaglyph stereoscopy could be implemented as well (for normal monitors and red-cyan glasses). It's a lot more ugly I know, but surely enough works when you don't have better hardware... I use it a lot in Minecraft and it's awesome. That is so awesome. Damn, I still didn't understand a percent of what you're saying, but all my fingers crossed for you. Please keep up this great work. Well that's interesting news about vorpx and open GL support. I had tried this about a year ago with an older vorpx version with no luck. That's good you at least got the 3D working. I will have to give it a try. Thanks for the tips bucklebean. It worked well using your first method, but alas only 2D. I then tried your star trek method with geometry 3d and was surprised to have no problem with framerate. Unfortunately, I could not get the FOV right, it was a distorted mess (very stretched horizontally). I fought with the resolution and aspect ratios, but the only thing that fixed it was to lower the zoom level in the vorpx menu to 0.6. That removed the bad warping, but resulted in a letter-box view. I'll give it another shot tomorrow when I'm fresh. just noticed that: seta r_mode "-1" keeps resetting itself to seta r_mode "3"
 Problem solved! I missed the part where the custom resolution also had to be applied to the nvidia control panel, not just the darkmod.cfg file (this also stopped r_mode from reverting). Edited by grodenglaive, 14 January 2016 - 06:38 AM. @ Nico - it's my pleasure. TDM in VR (or something like it) is pretty much all I'd ever need to justify buying one of these devices. I'd be happy to answer any questions you might have. @ grodenglaive - glad it's working for you. FOV is tricky. I did not need to apply the custom resolution in the Nvidia control panel, though that's what's recommended. I can't get that to work on my system for some reason, but just editing the .ini files works for me. Another option would be to try the game in windowed mode, but since you got it sorted, no need to mess around more. Having the custom resolution with the 8:9 aspect ratio, coupled with the r_fovratio setting, should get you most of the way there. I may have forgotten to mention that, along with these settings, I'm using Pixel 1:1 in the vorpx menu and I've lowered the zoom level in the to .92 & it's damn near perfect. No letter-boxing and the warping is almost imperceptible. I've also noticed that at this aspect ratio I prefer edge-peek to be zoomed all the way in. Works great for reading notes, etc... And be careful changing the 3D setting. Z3D & Z-Adaptive don't work and completely scramble the screen, so you can't see anything in order to change it back. I'm jealous of your lack of framerate issues. Mind sharing your specs? See mine below. Are you hitting a solid 75fps or locking in to 60fps and relying on timewarp for a comfy experience? I'd be curious to know if there's anything I could tweak to get it stable. Could also be the particular mission I'm running. Oh, I meant to say that I have placed my order for the consumer version of the Rift & plan to keep at this when I get it. I'm still waiting for pricing on the Vive. I'm not sure I can justify the expense, especially if it approaches $1000 or beyond. sorry for the late reply - I thought I had subscribed to this thread. According to Fraps, I'm locked at 75 fps. Gameplay is smooth most of the time, but I have run into the occasional area where there is judder (mostly outdoors). I turned v-sync OFF in the game, but set to ON in the control panel. When I set up the game I had my desktop set at a custom 1280x1440 @75 Hz. Without that I couldn't get the aspect ratio to stick. Oddly enough, I don't need to keep my desktop at this setting to run the game - it was only needed for the initial setup. Coincidentally, I also settled on 0.92 zoom, so we must be doing something right! Also using 1:1 pixel in vorpx and r_fovRatio is 0.889 in the cfg. After a lot of fiddling, I lowered the 3D separation to 0.26. People look the most natural now (at 1.0 everything looked small). This setting seems to be analogous to a slider for IPD, so ymmv (mine is only 58 mm). The actual IPD setting in vorpx doesn't do anything. Turning off post processing fixed the lighting anomalies due to bloom and now everything looks fantastic. The only issue left is the skybox - the moon and stars are only about 10 feet away, so don't look up. I played Crucible of Omens all weekend; it is excellent! Looking forward to the consumer Rift as well - should be fun. I'm sure Ralph will be quick to update vorpx. @ Hiradur - Thanks so much! This looks great. Sound is soooo important for an experience like this. @ grodenglaive - no worries on the late reply. There's no real urgency. My main hope is that some folks will be able to take what I've done and further refine (or expand upon) a process for a good set up, like you've done. I've been distracted lately by early splinter cell games for some odd reason. I'm still very jealous of your framerate. Aside from your better processor & higher clocked ram, the main difference I see is your ability to set your monitor's refresh rate to 75. My monitor is 144hz, but has discrete options to do 60, 85, 100, 120, & 144. It will not accept a custom setting of 75, so I simply cannot test. I'm going to set it to 60 & see where that gets me. If TDM is highly processor dependent, that could also be cause for fps struggles, though my 2500k does quite well in most games. Anyway, keep at it. Crucible of Omens is next on my list. EDIT: Locking my monitor's refresh rate to 60 had no impact. Edited by BuckleBean, 26 January 2016 - 04:25 PM. thanks, I will definitely try that out. I just tried it. I'm happy to report that the positional audio works not only when rotating your avatar with your mouse/stick, but also when just turning your head. Very nice! Btw when writing the batch file to test the OpenAL installation, don't forget to rename TheDarkMod.exe to stvoy.exe if you changed that for vorpx. It took me awhile to realize that. I'm happy you guys enjoy playing with HRTF. I'd love to get my hands on a VR device but so far I couldn't decide which one I should take and if it's not a bit too early to jump on the train, in particular since I'm more of a Linux guy. I made some experiments with Trinus Gyre (now called Trinus VR) and Google Cardboard a year ago but it was a hassle to setup, and the quality of Google Cardboard is too low to give any kind of enjoyable experience.